Antron Brown, who is a Chesterfield, NJ native, set a track record at the 46th annual Toyota NHRA Summernationals. The Toyota driver went 3.725 at 317.57. Following Brown is J.R. Todd, who is second with a 3.727. Tony Schumacher is third with a 3.736. Dote Racing driver Leah Pritchett is fourth at 3.736. Shawn Langdon, who could potentially be racing his final race of the season, is currently fifth. He went 3.737. Brittany Force in her third race with Monster Energy as her sponsor is sixth at 3.747. She was in the final pairing with Brown when he had his run for the record. Spencer Massey is currently seventh at 3.765, following by Doug Kalitta, who is eighth with a 3.766. Clay Millican, who is still working for his first career NHRA win, is ninth at 3.769. Rounding out of the Top 10 is Steve Torrence at 3.781. The next two cars are Morgan Lucas Racing, who are 11th and 12th. Richie Crampton, who won his first career race here last year, is currently 11th at 3.784. Morgan Lucas is 12th at 3.857. Lucas also had an explosion in his dragster in session two that caused a major delay. Currently on the outside looking in is Terry McMillen, who is 13th. 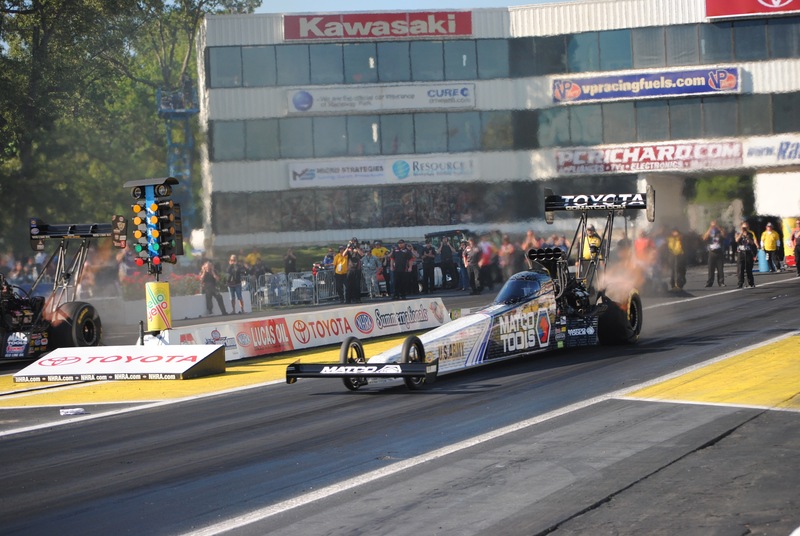 Rookie C&J Energy Top Fuel driver Dave Connolly is 14th. Jenna Haddock is 15th, and Larry Dixon is 16th.